Hi friends! Enjoy this healthy, scrumptious fusion cooking at home. 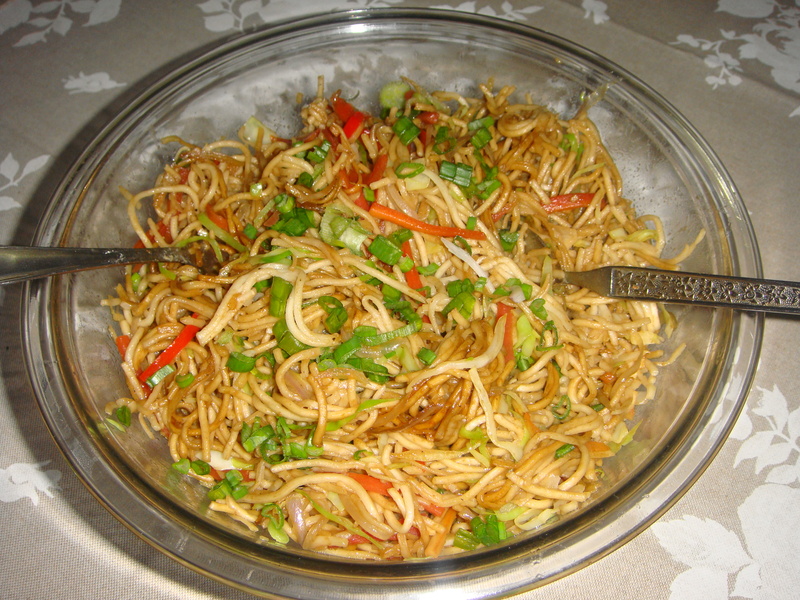 Vegetable noodles is a healthy Indo Chinese noodles recipe with good quantity of vegetables. Heat one liter water in a pan with salt and few drops of oil, when water starts to boil add noodles and cook until they are cooked. Drain noodles in a colander or sieve, use tap water to rinse noodles and keep side. While noodles getting cooked, peel and cut thin strips of carrot, cabbage, , finely chop onion, beans, capsicum, spring onion, and garlic. Keep aside . Heat oil in a heavy bottom pan add garlic, finely chopped onions saute for few minutes. Add carrot, cabbage strips, beans and saute for three -four minutes on medium to high flame. Add spring onions (white part) and saute until light golden brown saute until soft and pink add capsicum strips. Now add salt, pepper green chili sauce, soya sauce, vinegar and mix everything well. Add cooked and rinsed noodles and mix well to blend, add spring onion and mix again and cook for 1-2 minutes, switch off the stove. Serve hot with vegetable Manchurian or sweet and sour vegetable curry. To keep vegetables from getting over cooked , vegetables are cooked on high flame. To keep the noodles from getting sticky , just keep cooked noodles under tap water and toss gently. Besides their convenience, mixed frozen vegetables are complementary — some vegetables add nutrients to the mix that others lack — giving you a wider variety of nutrients in the blend. The only nutrient you won’t get from mixed vegetables is vitamin B-12, because it’s found in animal products. Vegetables have soluble and insoluble fiber. Soluble fiber keeps blood sugar balanced by slowing absorption of carbohydrates. It also lowers cholesterol by carrying it out of the body. Insoluble fiber keeps food moving through the digestive tract, which prevents constipation and diverticular disease. The substances that give vegetables their color — carotenoids — provide nutrients for your eyes because they’re a form of vitamin A. Mixed vegetables contain several carotenoids: alpha-carotene, beta-carotene, lutein and zeaxanthin. Alpha- and beta-carotene are converted into the form of vitamin A that is essential for vision. Lutein and zeaxanthin function as antioxidants. They’re the only carotenoids found in the retina, where they may help prevent age-related macular degeneration. One cup of boiled, mixed vegetables delivers more than 200 percent of the recommended daily intake of vitamin A. In addition to antioxidants that support your eyes, mixed vegetables have other antioxidants that fight free radicals. Free radicals are produced as a byproduct of essential biochemical processes. If they’re not neutralized by antioxidants, free radicals cause cellular damage that leads to illnesses, such as cardiovascular disease. The same portion of mixed vegetables has 30 percent of the recommended daily intake of manganese and 5 percent of the daily value of vitamins C and E. As a water-soluble antioxidant, vitamin C protects cells throughout the body. Vitamin E is a fat-soluble antioxidant, which gives it the ability to neutralize free radicals in lipids that have varied roles, such as providing cellular structure and transporting fats through the blood. Manganese has the job of protecting mitochondria, which are the structures inside cells that produce energy. Green peas are the highest source of vitamin C, while lima beans and carrots boost vitamin E. Lima beans also have at least double the manganese of other vegetables. Calcium and phosphorus combine to form the mineral that builds bones, called hydroxyapatite. Bones are continuously maintained through a process in which old or damaged bone is removed and rebuilt. You need a constant supply of these minerals throughout your life to keep your bones healthy and to prevent osteoporosis. You’ll gain 5 percent of the recommended daily intake of calcium and 13 percent of phosphorus from 1 cup of mixed vegetables. All of the vegetables have both minerals, but corn is low in calcium, while snap beans and carrots have less phosphorus than the others. Combine mixed frozen vegetables with ground beef, onions and beef broth, and top them with mashed potatoes to make shepherd’s pie. Use them in a stir-fry with chicken and soy sauce or turn mixed vegetables into a casserole with the addition of onion, cheese and mayonnaise. Make a quick vegetable soup by adding a bag of mixed vegetables to beef broth and undrained, canned tomatoes. Alternatively, use them in a salad.